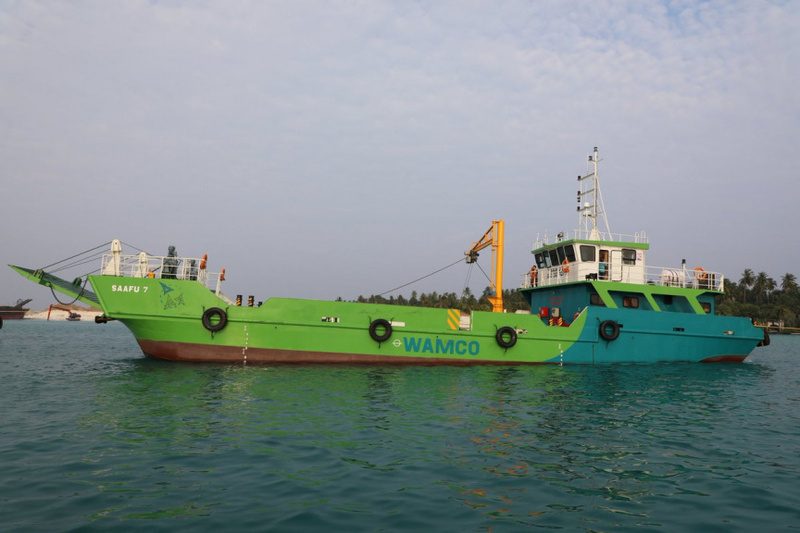 A landing craft of the Waste Management Corporation (WAMCO). Waste Management Corporation has said that they took out waste worth of eight landing crafts out of Male' City on the first of Ramadan. Talking on PSM's Raajje Miadhu (Maldives Today) program, the Assistant Manager of Household Collection at WAMCO, Mohamed Shan said that they it has not been long since WAMCO started up and so there were difficulties in waste collection in the first three days of this Ramadan. He said that they received 300 calls on the first day of Ramadan to their call center which meaning they couldn't provide their services to 100 percent. And now they receive 30-40 calls meaning it's normal for a company that provides service to 17,000 households. Shan said that in an attempt to take off the load from their employees in Ramadan, they decided to make waste collections at night only but there were difficulties in taking the collected waste out of the city and there were complaints from the public. But now, the waste collection times have been increased and the service is being provided efficiently.